Can you make money with the Robinhood app? We’re dropping our honest Robinhood app review today. Kyle and I tested the app for over a year, and we have a few things to say about it. Well, mainly Kyle tested it and I took copious notes. What is the Robinhood app? To kick off the Robinhood app review, let’s define what it is. Robinhood is an investment app that has zero cost transactions. Almost all other investment apps have an expense when you buy a stock, ETF, or any other thing they offer on their website. Other investing platforms like TDAmeritrade or E*Trade will charge you a fee every time you want to buy and/or sell stock. At the time this post was written, TDAmeritrade charges $6.95 per trade. That means if you want to buy a share of Apple and then sell it at a later date, you will effectively pay $13.90 to make that transaction. Robinhood makes interest off of the uninvested money sitting in your account. Let’s say you deposit $1,000 into your Robinhood account. But then you don’t purchase any stock. Robinhood will earn interest off of that $1,000. To be clear, you still have access to that $1,000 but you won’t be making any money off it sitting in your account. Be wise, and move money in your Robinhood account immediately into stocks or ETFs. That’s the whole point of Robinhood! Kyle and I each have our own Robinhood accounts. 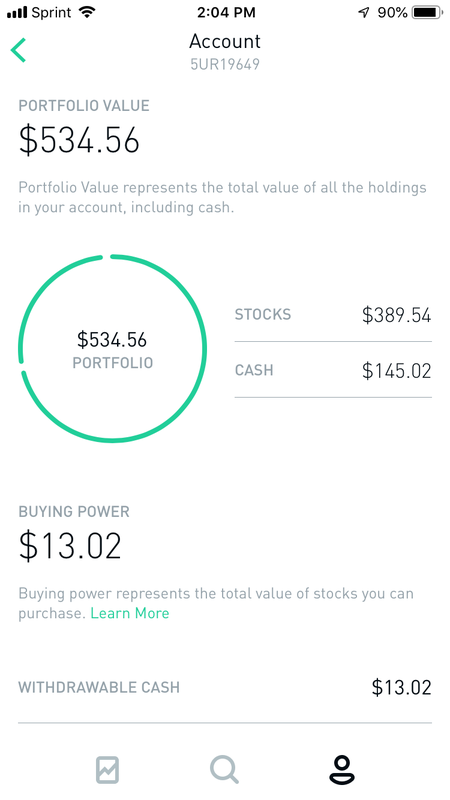 As part of this Robinhood app review, I took a look at where my money was at. Looks like I had $145 sitting in cash. Oops. And that’s how Robinhood made money off of me. You might be wondering why competitors have higher costs than Robinhood. Some competitors have actual storefronts, which costs money to maintain. For example, E*Trade has physical branch locations. In order to pay for overhead costs, they will pass on fees to the customer. Robinhood does not have a physical location and therefore can keep its costs low. Another reason competitors charge more is that they have active account managers. Account managers can make several changes to your fund portfolio based on market trends. Robinhood does not use active managers. That’s pretty much your job. With any app, there comes a few limitations. We found in our Robinhood app review that the chart information inside of the app is lacking compared to others. Likewise, the analysis tools aren’t as robust as larger platforms. Not all stocks are supported on the platform, either. 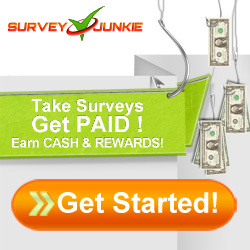 You may not find certain companies listed if you are looking for something in particular. 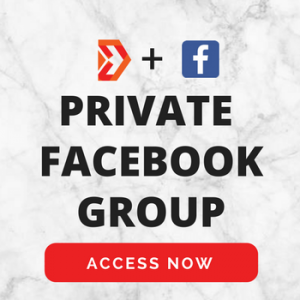 But all the big movers and shakers, like Apple and Facebook, are listed for purchase. Who is Robinhood good for? Robinhood is great for people who enjoy watching the stock market and actively participating in it. This is a great tool for people who want to try their hand at investing in individual stocks versus low-cost index funds. 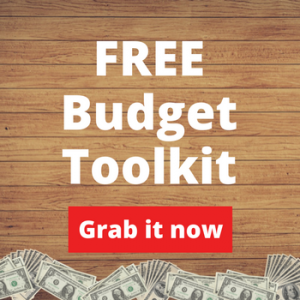 You also don’t need a ton of money to get started. Because Robinhood has zero management fees, you can easily invest just $100 in any stock. Who should not use Robinhood? If you have credit card debt and don’t have a proper Oh Sh!t Fund in place, you should not be gambling with your money on Robinhood. Gambling is a harsh word, I know, but it’s true. Nothing in the stock market is guaranteed. You have to be 1,000% okay with the potential of losing your money on Robinhood. Kyle started off with $500 in Robinhood. We are debt free, and we are extremely thankful that we have extra cash to put in an investment. After seeing how he made money with that $500 in a few months, we made the decision to add more money to his account. 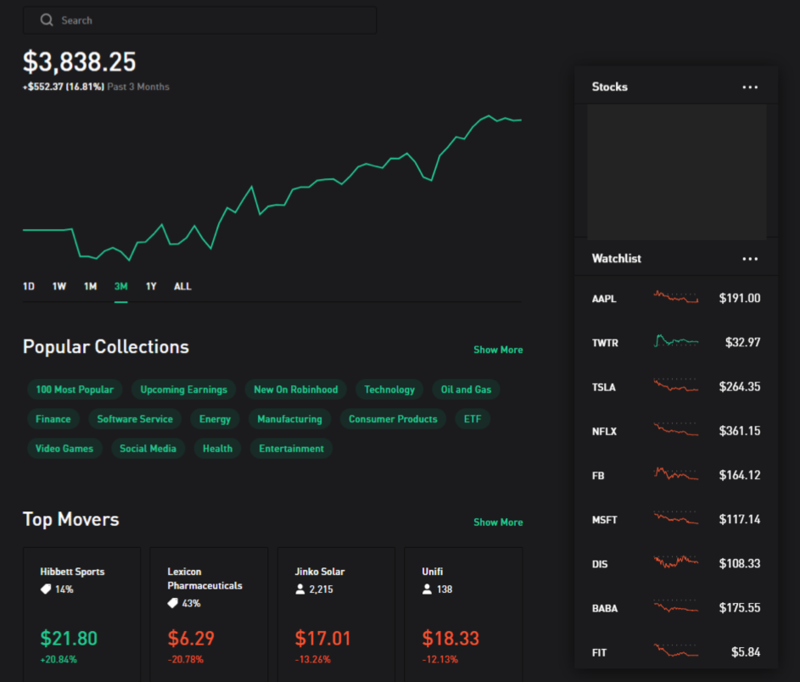 Here is a screenshot of the dashboard to give you an idea of what Robinhood looks like. It’s easy to use, in my opinion. They are also rolling out new features, like Robinhood Gold and cash management. The cash management accounts has an enticing offer. Robinhood is offering to pay up to 3% interest in those accounts. Keep in mind, this is not a savings account. The money will go into an investment. Just be sure to read the terms to make sure this type of investment is FDIC or SIPC (Securities Investors Protection Corporation) insured. Have you tried Robinhood before? What are your thoughts on the investing app? If you want to join Robinhood, use this link and we’ll both get a free stock like Apple, Ford, or Sprint for free!